Though yesterday’s supper featured pork chops (certified humane raised) in a buttery, wine shallot sauce, Jean declared that the vegetables were really the highlight of the meal. Quite easy to prepare, and Ontario broccoli and cauliflower are in season now. 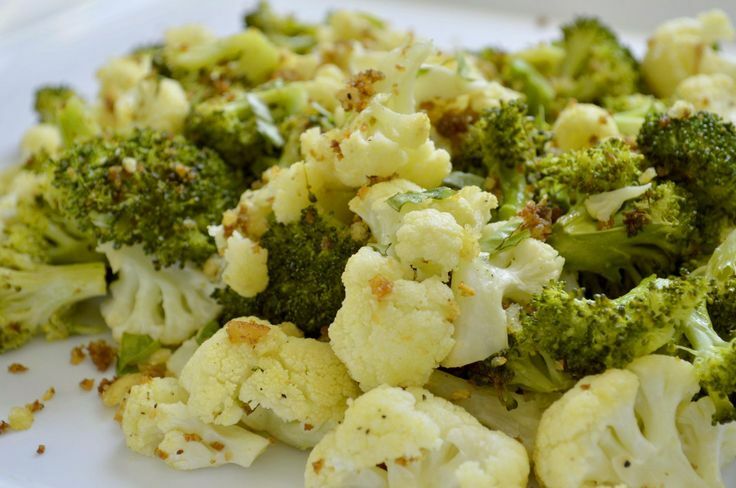 Toss 750 g broccoli and cauliflower florets in 2 Tbs. extra-virgin olive oil. Roast on a baking tray at 400° F for 20 minutes. Whisk together the zest of ½ lemon, 1 Tbs. lemon juice, 2 Tbs. each extra-virgin olive oil, Parmesan, hot water, and chopped toasted pine nuts. Season with freshly ground black pepper. Toss with the roasted florets. Not our photo! But a reasonable facsimile. Recipe from the Center for Science in the Public Interest’s Nutrition Action Newsletter. Their recipes are nearly always excellent. Categories: Food | Tags: food, recipes | Permalink.